The women’s costumes underwent radical changes in the Victorian era. The dresses worn by women in the early Victorian period showed resemblance to those worn by women in the Georgian age. Etiquette was an important factor in case of the Victorian clothing. The dresses worn by women covered their entire body. It was prohibited for a woman to even show her ankles. The corsets worn restricted the movements of a woman. During the initial years of the Victorian rule, namely the 1840 and 1850 period, the gowns worn by women were narrow and had sloping shoulders. They also had low but pointed waists and bell-shaped skirts. 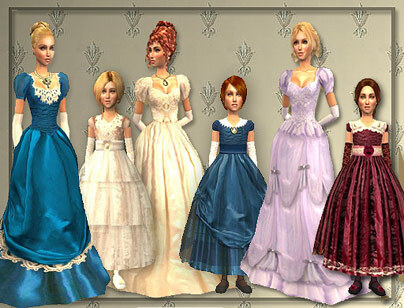 Women wore corsets, which reached up to the knees and layers of petticoats under their gowns. Later on, pantalettes and crinoline were used instead of petticoats and chemise. The reason for this change was that the size of the skirts had expanded and so pantalettes was more suited to this new change. The dresses worn by women during the day had a solid bodice. For the evening occasions, the Victorian women had some liberty as they could bear the shoulders and upper part of the chest. This apparel was completed by a shawl and opera-length gloves. This was the case of upper and middle-class women. Shawls also formed a part of the Victorian costume. By 1860, the skirts were flat at the front. The day dresses had pagoda sleeves and a high neckline. These necklines either had a lace or tatted collar on them. However, for the evening wear, the gowns had a low neckline and short sleeves along with appropriate gloves. Somewhere in 1870, tea-gowns were introduced for casual get-togethers at home. By 1867 Crinoline was replaced by Bustles to hold the skirts up. The invention of the sewing machine in the late 18th century enabled the women to wear sewn clothes. The use of machine brought about a lot of change in the clothing fashion. The dressing is dated between 1740 and 1785. Note the flat front of the pointed bodice, the split overskirt with exposed underskirt. This is Georgian/ Rococo/ Baroque. Jacket and skirts which matched the hunting outfit were worn in the 1880s. The shirt was high collared and the top-hat had a veil. The skirts worn for hunting purposes were up to the ankle length accompanied with proper boots. Women while going for a walk wore long jackets and a skirt, with bustle and a small hat or bonnet. By 1887, the sleeves of the dresses had become slimmer and close fitting. The women’s gowns during the 1880s were primarily made in two colors material namely, deep red, peacock blue, royal blue, purple, etc. These colors were either used alone or in combination or in tartan fabrics. 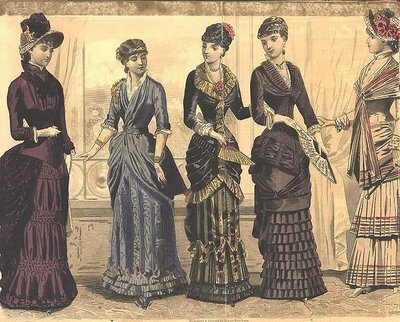 During the 1890s the women’s fashion was simple as compared to the earlier years. 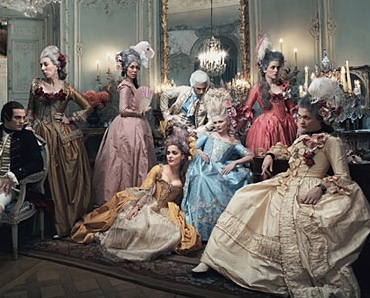 Women did not use bustles and crinoline and the dresses were no longer tight fitted. Corsets were longer giving the women a slight S-curve silhouette. Skirts worn were closely fitted over the hip and flared just above the knees. Women preferred high necks and puffed sleeves. Also, sportswear like the bicycling dress, tennis dress, etc was worn by women. The sleeves changed from slim to leg of mutton sleeves at the end of Victorian times. By 1895 the sleeves were very puffed like those worn by women in 1833. The late Victorian women wore sharper tailored jackets which gave them an altogether different posture and confidence.